Micromex has extensive experience in assisting Local Government Organisations in undertaking effective community research and engagement programs. Over the last few years, Micromex Research has assisted more than 60 Government organisations in developing effective and actionable community research and consultation programs. Our research outcomes clearly illustrate how Local Government Organisations can proactively drive community satisfaction. The usual outcome of a community satisfaction survey is that all the services and facilities provided by Local Government entities end up being rated as important or very important. We not only discover what is important now but look at your stakeholders’ aspirations. Our goal is to connect you with your community. 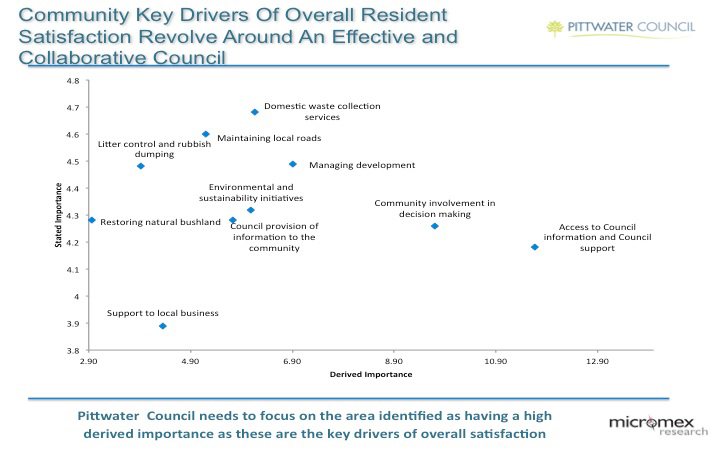 Research shows that residents rate all services and facilities provided by councils as important. By using Shapley’s Regression Analysis, Micromex will provide insights into the factors that drive satisfaction. The approach is based on determining the statistical association between the performance ratings (stated importance) for a product or service attribute and a broader performance criterion (derived importance). The outcomes will provide councils with a robust level of understanding of how to address community priorities and leverage community satisfaction. We have developed Benchmarks based on over 30,000 community interviews, which allow us to measure exactly how your organisation is performing relative to other providers in terms of servicing, facilities and resident satisfaction.